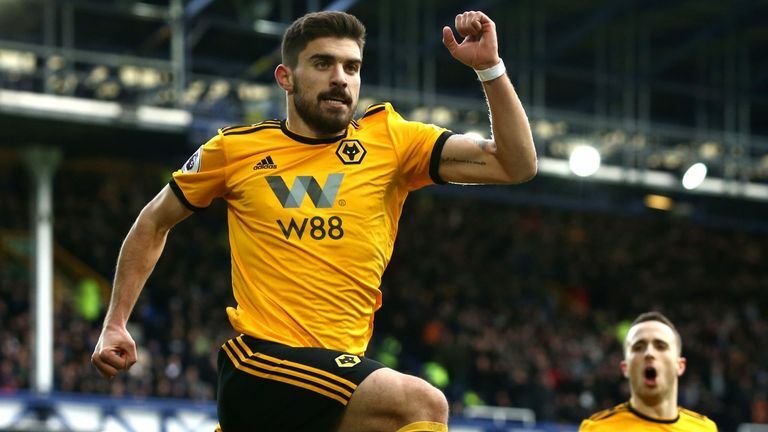 Wolves maintained their recent good form by beating a lacklustre Everton 3-1 at Goodison Park on Saturday. The visitors made it three Premier League wins in a row thanks to first-half strikes from Ruben Neves (7) - via the penalty spot - and Raul Jimenez (45), separated by Andre Gomes' (27) first-ever goal for Everton. 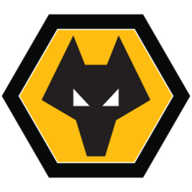 However, Leander Dendoncker restored Wolves' two-goal advantage with his first goal for the club midway through the second half as Nuno Espirito Santo's side stayed seventh after an eighth win in their last 12 matches. 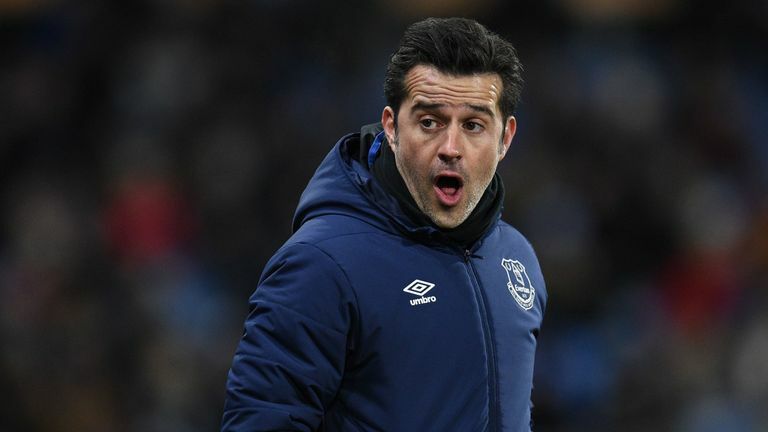 Everton, though, drop to ninth after a fourth league defeat at home this season as the pressure mounts on boss Marco Silva. 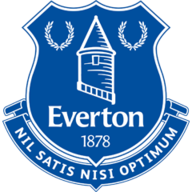 There was a nervousness among the home faithful in the early stages after Everton's recent struggles in front of their own fans - the Toffees had won just one of their previous five league games. All of which was not helped by Leighton Baines' early concession of a penalty after a clear foul on Matt Doherty, with Neves calmly stroking home the resulting spot kick, just the second time the Portuguese has scored for Wolves from inside the box. Twenty minutes later and totally out of the blue, Everton drew level thanks to a goal to remember from Gomes, who collected Cenk Tosun's pass, before striding forward and hammering an unstoppable drive into the roof of the net. The home team, who lost captain Baines to injury before the break, would have got through to half-time on level terms, but for a needless foul by Michael Keane on Diogo Jota. That allowed Joao Moutinho the opportunity to curl an inviting ball into the area, from which the unmarked Jimenez placed a header past a helpless Pickford for his 11th goal of the season. If Goodison was muted at the start of the second period, then it was silent when Wolves all but confirmed their win after 66 minutes as the home team were again made to pay for giving away possession near halfway. Everton midfielder Idrissa Gueye (groin) and defender Yerry Mina (foot) were injured, while Leighton Baines replaced the suspended Lucas Digne at left back and Theo Walcott came in for the benched Bernard. Meanwhile, Wolves made one change from their 3-0 home win over West Ham in midweek, with centre-back Willy Boly back from a three-match ban in place of Romain Saiss, who dropped to the bench. Within the blink of an eye, the outstanding Jota was bearing down on goal and despite the forward's effort being blocked, the rebound fell straight to Dendoncker, who thumped home a volley as the visitors confirmed a first win at Goodison in 40 years. 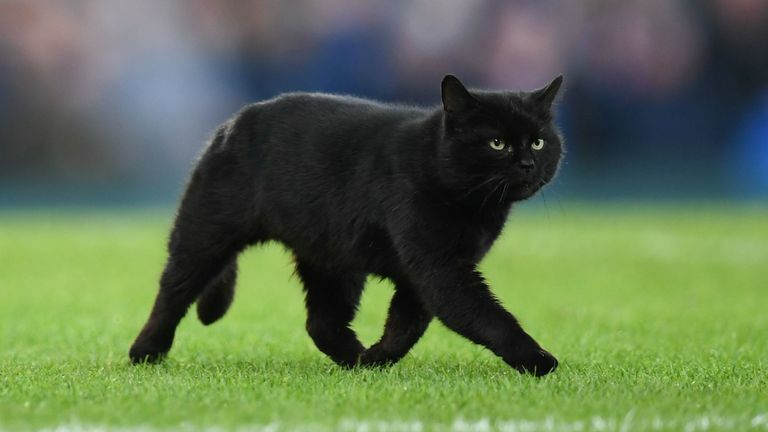 Everton's miserable afternoon was then summed up by a stray black cat who held up play for a full five minutes as ground staff tried, and failed, to catch and remove it from the field of play. 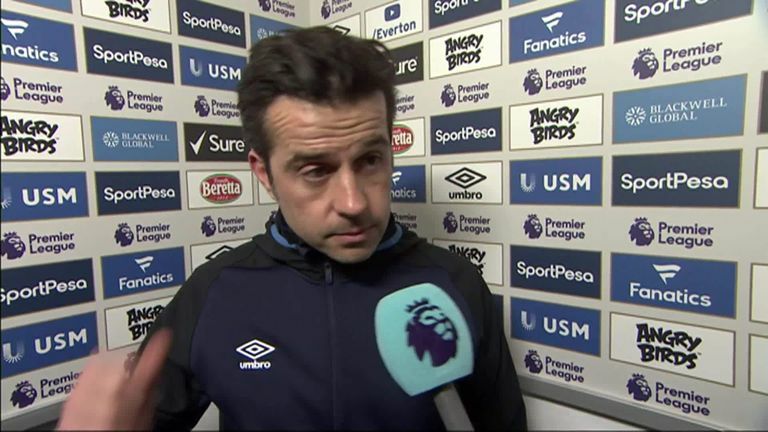 Marco Silva: "I understand why they are like they are, of course they expect a good afternoon again after our last good win at Goodison, they expect to come here and we win again and achieve the position we want in the table. "It was an important game for us, and of course when they saw our performance, they were not happy. I am here to say that as I and the players are clearly not happy and I can imagine how our fans are. "But it is up to us to keep fighting and improve, as we must improve, and stop giving things away to easily to our opponents." 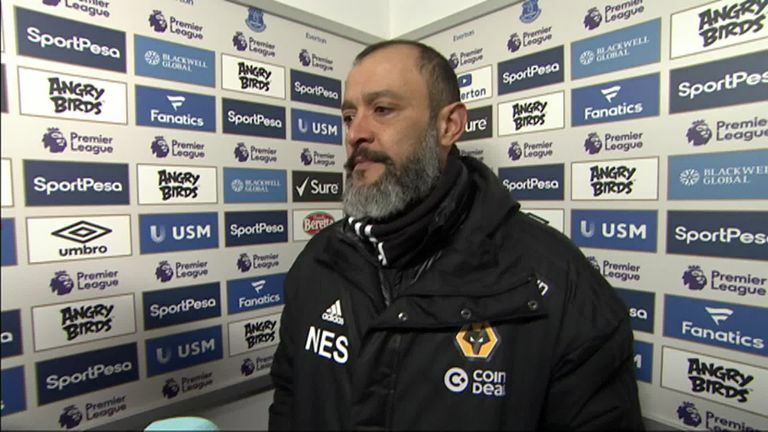 Nuno Espirito Santo: "It was a good game, a good performance which allowed us to play a good team in a tough stadium and go out in a proud way. I'm proud of my boys, they ran all game. The Portuguese continued his recent impressive form with another outstanding attacking display for Wolves at Goodison on Saturday. The diminutive forward ran the Everton back line ragged all match long and while he did not get his name on the scoresheet, he still played a key role in two of his side's goals. It was the 22-year-old's direct run into box that led to the visitors' early penalty, while it was from his powerful shot that Wolves added a third midway through the second period. "There is no balance. Defensively they occasionally play well, but where are the days where we have full backs overlapping with energy and good crossing of the ball from Everton? "But when you do not have the ball, you have to have that balance right. They do not protect the two centre backs or full backs and if you do nit get the balance of the team right, then it becomes easy to break down and predictable. "And it is going nowhere fast at Everton." Everton host champions Man City at Goodison Park on Wednesday night, while Wolves entertain Shrewsbury in an FA Cup fourth-round replay, before then taking on Newcastle at Molineux on Monday Night Football on February 11.